Darcy had breast cancer at age 42. Genetic testing showed that she had two VUS, one in the ATM gene and one in the BRCA1 gene. 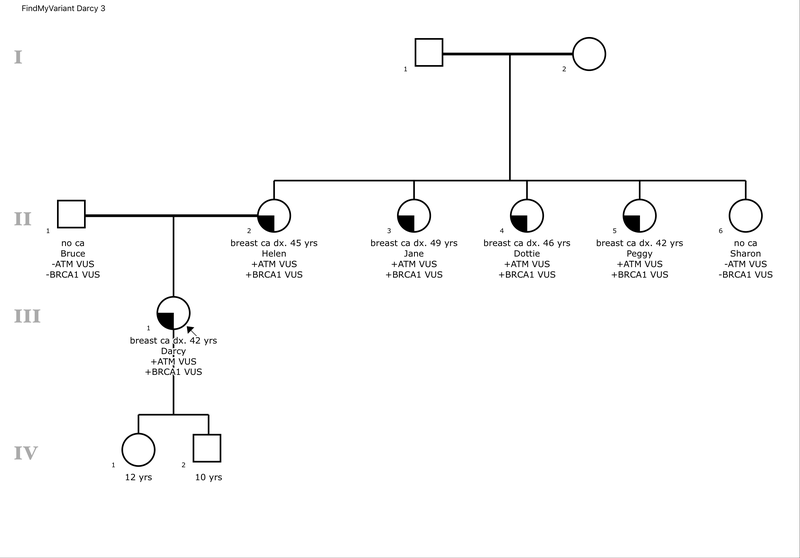 Both of these genes can be associated with breast cancer, but there was not enough information on either VUS to determine whether one or the other was related to her diagnosis. Darcy was worried about the breast cancer risk for her kids and other members of her family, especially since there was a lot of breast cancer in her family going back several generations. Darcy’s mother Helen, her maternal aunts Jane, Dottie, and Peggy, and other maternal relatives had also had breast cancer at early ages. Darcy’s mother Helen had passed away already, but her father Bruce agreed to get testing. Bruce did not have the ATM VUS or the BRCA1 VUS, which meant that Darcy got both variants from her mother. Darcy asked her maternal aunts to get testing first. Darcy’s aunt Sharon, who had never had breast cancer, did not have the ATM VUS or the BRCA1 VUS. Aunt Jane, Aunt Dottie, and Aunt Peggy, who each had breast cancer, all had both the ATM VUS and the BRCA1 VUS. While these results provided some information that the ATM and BRCA1 VUS might be disease-causing, it was not clear which VUS might be more likely than the other. Darcy’s maternal grandmother Carol was still living in her 80s. Carol had breast cancer in her 40s, and Carol’s sister, mother, and grandmother (Darcy’s great-aunt, great-grandmother, and great-great-grandmother) all had breast cancer in their 40s or 50s. Carol agreed to get tested for both variants. It turned out that Carol had the BRCA1 variant, but she did not have the ATM VUS. This meant that Darcy’s maternal grandfather, Nicholas, was the one who had the ATM VUS. Darcy asked Carol if Nicholas’ family had any history of breast cancer which might show the ATM VUS was disease-causing. Carol mentioned that Nicholas had lots of sisters, but none of them had ever had breast cancer. Most of them had died in their 80s. Nicholas’ parents both lived into their late 70s and died of heart or lung issues. 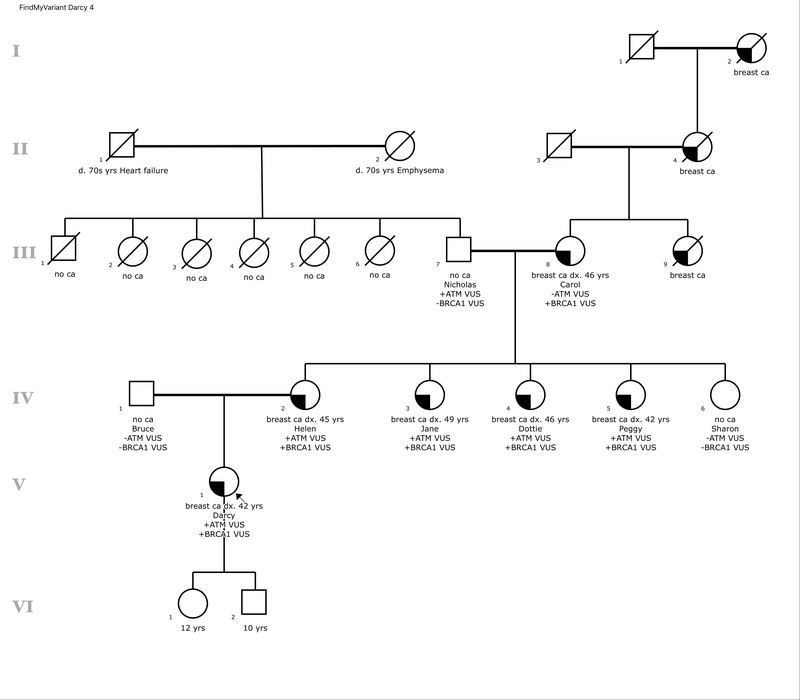 Figuring out that the BRCA1 VUS came from Carol (Darcy’s grandmother), who had a family history of breast cancer, helped classify the BRCA1 VUS as pathogenic, especially since Carol was the one with a family history of breast cancer. Figuring out that the ATM VUS came from Nicholas (Darcy’s grandfather), who had no family history of breast cancer, helped reclassify the ATM VUS as likely benign. Knowing that the BRCA1 variant was pathogenic also helped classify the ATM variant as likely benign because all the early onset breast cancer in Darcy’s family could be explained by the BRCA1 variant.